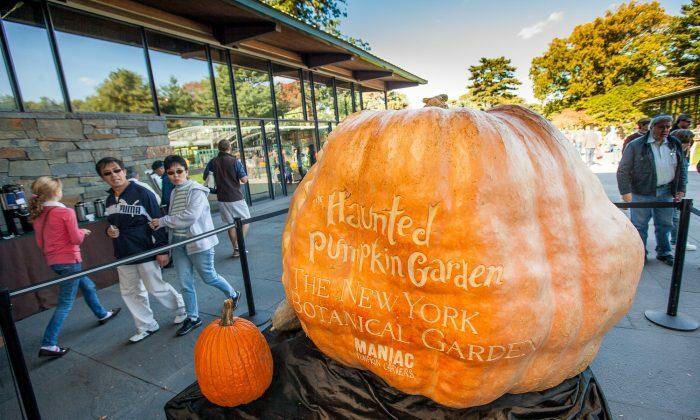 NEW YORK—Three of the largest pumpkins in the world are on display in New York Botanical Garden. Some are getting masterfully carved by Ray Villafane and his team, the best in the pumpkin-carving business. “Everyone loves pumpkins, everyone loves pumpkin carving on them,” said Villafane, standing in front of pumpkin-filled Clay Family Picnic Pavilions on Sunday afternoon. For Villafane, it all began 15 years ago, when he was teaching art in kindergarten, carving faces in pumpkins for children in his class. “They just kept bringing pumpkins,” Villafane said. Five years later Villafane moved his career to professional sculpting and that’s when he made his ideas come true. Villafane sculpted pumpkins into faces with remarkably detailed, lifelike, and realistic features. The venture then took off, with pictures of his work going viral on the Internet, and TV stations asking for interviews. As he spoke, Villafane was carving the biggest pumpkin of the year. It was grown by Tim and Susan Mathison in Napa, California and weighs 2,032 pounds. The pumpkin is going to turn into a gigantic Venus flytrap by Sunday evening and will remain on display for weeks to come, until natural decay gets its way with it. Pumpkin carving is a fleeting business. Pumpkins start to rot as soon as they are cut from the vein. Color change comes in a matter of days and in a few weeks the work begins to lose its visual appeal. “Growing pumpkins is much like growing babies,” said Dawn Northrup from Sussex, Canada. Pumpkins have to be covered with at night and protected from sunshine during summer days, lest they explode from overheating. One can almost see them grow, as they gain as much as 50 pounds a day, provided they get plenty of water, manure, and fertilizer. Dawn and her husband Bill Northrup should know, growing six plants of the Atlantic Giant variety in their backyard every year. This time the Northrups grew a 1,813 pound pumpkin, which took third place. As far as the other five of their giants are concerned, the couple would just line them up by their house. About a week before Halloween, Bill Northrup would carve them into lanterns. Kelsi Gelati and her mother Gayle came from Connecticut just to see Villafane ‘s carvings. Since Kelsi is also into the arts and plans a career in this direction. “I love it. I think it looks amazing so far and it’s going to turn up great,” Gelati said. Turan Saul brought her twin sons Asher and Zachary with her. Even after an hour in the Garden the three year olds didn’t seem bored at all. The tradition of pumpkin carving is big enough in and of itself, and if you add top notch artistic skill and talent to it, you’re bound to get an exciting show.